Cast: Bill Murray, Billy Connolly, Breckin Meyer, Jennifer Love Hewitt, Lucy Davis, Tim Curry, Bob Hoskins, Richard E Grant, Jane Horrocks. Directed by Tim Hill, partly written by Joel Cohen. Story: Kitty goes to London. Garfield's second helping centres around a posh pampered Britty kitty who conveniently looks exactly like old Garfers. Can you guess what happens next, children? Of course you can, even Shakespeare thrashed the crap out of that plotline. All the original actors have signed up again, most importantly Bill Murray as the eponymous greedy orange moggy, and this time he's joined by Billy Connolly, giving a sufficient if one-dimensional turn as the bad guy who wants the estate that Garfield's doppelganger has just inherited ... hmmm, yes, the plot is indeed a tad fragile. Posh Garfield introduces a load of other animal friends who, like Odie, are live action beasties with their computer assistance limited to mouth movements. Their voices are provided by British acting royalty - Bob Hoskins, Richard E Grant and Jane Horrocks - and are accompanied in bit parts by the eclectic casting of Sharon Osbourne, Jane Leeves (Daphne from Frasier), Vinnie Jones, Rhys Ifans and Joe Pasquale. And I bet that sentence has never been used before. I have to be honest - there's nothing very special about Garfield 2. It's very similar in feel to the original, but without the benefit of the novelty. Lucy Davis, Dawn the secretary from The Office, is criminally under-used - and underfed as well by the look of it. I'm sure she gets more work looking like a cloned model, but some of us prefer womanly curves and individuality, and she certainly has the talent to make it without becoming a carbon copy of everyone else in the industry. Garfield himself is nicely animated and wonderfully voiced by a dry Bill Murray, but it can't hide the fact that the movie is distinctly average. Garfield 2 is a pleasant enough way to while away an hour and a bit, but fails to add anything new or to create any lasting memories. Useful to keep the kids (or yourself) occupied when it comes out on DVD. To enjoy this film you should be: bored. 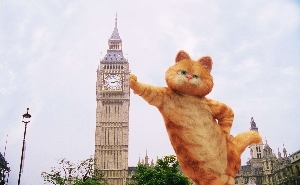 Garfield 2 was released in the UK on 21st July.